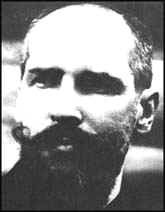 Citation: C N Trueman "Peter Stolypin"
Peter Stolypin was a remarkable man. All the evidence seems to point to a catastrophe within Russia at some point in the early C20th. Yet Peter Stolypin was the one man who is most associated with having the ability to save the Romanov’s. His assassination in 1911 probably doomed the Romanov’s to history. The seeming promises of Witte had infuriated the advisors of Nicholas II. He was dismissed from office and replaced by the elderly Gremykim. His Minister of Finance was Kokovtsev and his Minister of the Interior was Peter Stolypin. Stolypin was the son of a provincial officer in Saratov. Stolypin rose to be provincial governor in 1905. He gained a reputation as the only governor who was able to keep a firm hold on his province. Stolypin was the first governor to use effective police methods against those who might be suspected of causing trouble. It is said that he had a police record on every adult male in his province. Stolypin also ensured that his police force was totally loyal. The only criteria for promotion was effectiveness. While you were in Stolypin’s police force, you were safe. This bound you to the police. Any hint that a police officer was involved in corruption was met with dismissal. This took away from you the protection that the police offered – and Stolypin’s police force had many enemies. On of Stolypin’s great strengths as a politician was his ability to wait and observe rather than make an immediate decision. This served him well at the meeting of the First Duma. The reform programme of the Duma had been rejected by the government as inadmissible. This provoked great anger in the Duma and many took to the floor to criticise the government. Ministers responded by simply not listening to their calls – all except Stolypin. He listened to what was said – not because he agreed with all of it, but because it identified to him who Russia’s enemies were. It also showed him who were the more moderate – people whom he could probably work with in implementing the reforms he had in mind for Russia. Stolypin believed that the peasants were natural conservatives at heart. He planned to introduce reforms that would harness this conservatism and bring them on to the side of the government. In short, he wanted to foist onto them a bourgeois mentality by moving them away from their communal responsibilities and substituting this for individual responsibilities. Stolypin wanted to introduce a freehold system of land tenure. Stolypin believed that the peasants would thank the government for this improvement in their lifestyle and scupper any chance there might have been of the workers in the cities joining ranks with the peasants in the countryside. What Stolypin planned was nothing less than a major revolution in the countryside. Logic was on his side – the peasants were by nature conservative. Also by giving them the ownership of the land they worked, he would have been making them property owners. Such an elevation in their status would bring, so Stolypin believed, major support to the government and take away any semblance of support for what the Duma wanted. This, in turn, would strengthen autocracy in Russia – as the tsar would have the support of the majority of peasants and the power of the Duma would have been nullified. This is what Stolypin hoped for. However, he faced one huge problem – convincing others in the government that handing over land to the peasants was the way ahead. Some historians believe that if Stolypin had been able to introduce his land reforms and the peasants had ownership of their land, a large part of the anger that was building up against the government would have been dissipated. Other historians have argued that such reforms would have propelled Russia towards a revolution regardless, as the peasants would have wanted more, while the workers would have wanted some form of reform for themselves. This is all speculation as Stolypin’s assassination meant that his land reforms were never introduced. Stolypin’s time in government was a curious mix of desired for reform mixed with ardent repression of any unrest and Russification.